From left: Dr. Thomas P. Rosandich, Academy President; Robert Zimlich, Academy Curator; and Don Rush. 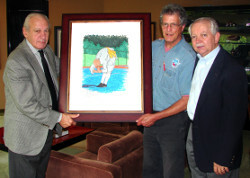 Don Rush, the President of Jireh Publishing and brother of the 2011 Sport Artist of the Year, Painter, Rick Rush, recently visited the Academy’s campus in Daphne, Ala., to deliver an original painting donated by Rush. The painting is one of 12 being donated to the American Sport Art Museum and Archives, a division of the United States Sports Academy, depicting “Fighting Monks” performing Shaolin Kung Fu. The painting were based on drawings penciled by Rush in November 2006 when His Excellency Abbot Shi Yongxin, the spiritual leader of hundreds of millions of Chan Buddhists and an advocate of the modern revival of Shaolin Kung Fu, was presented with an Honorary Doctorate at the Academy. Rick Rush sketches while watching a Chan Monk perform Shaolin Kung Fu.  To meet the needs and interests of today’s students in globally-relevant sports subjects, the Academy is launching a series of courses on Shaolin Kung Fu, which will be available to students in 2011. The first courses are on the History and Philosophy of Shaolin Kung Fu, as well as the Theory of Shaolin Kung Fu Practices. One of Rush’s 12 paintings will be selected to be featured on the cover of the textbook being developed by the Academy for the new international program. 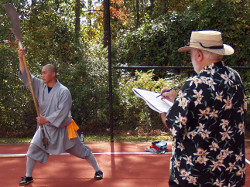 The U.S. Grandmaster of Shaolin, Steve DeMasco of New Hampshire, provided the Academy with English translations of rare, formerly secret, ancient, Shaolin manuscripts, which are being used as the basis for the textbook.